The National Mission on Sustainable Habitat is one of the eight climate mission of the Government of India under the NAPCC mitigation strategy. The Government of India had launched eight missions under the National Action Plan on Climate Change (NAPCC) to find out the mitigation option of climate change. 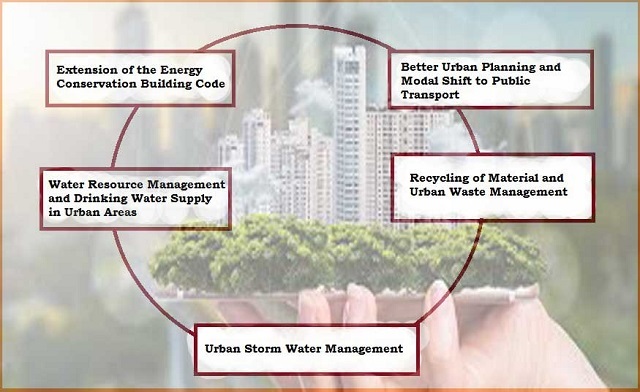 In this article, we are giving the concept, salient features, functional areas and objectives of the National Mission on Sustainable Habitat, which is very useful for the UPSC-prelims, SSC, State Services, NDA, CDS, and Railways etc. The transport is the second largest carbon Dioxide emitting sector after electricity and heat production globally, while building sector accounts more than 40% of energy use. Hence, India as a one of the major contributors to greenhouse gas emissions in the country, the buildings and transport sector. The Government of India had launched eight missions under the National Action Plan on Climate Change (NAPCC) to find out the mitigation option of climate change. The National Mission on Sustainable Habitat is one of the eight climate mission of the Government of India under the NAPCC mitigation strategy. It was formulated to make the cities sustainable through improvements in energy efficiency in building, management of solid waste and to shift to public transport. 3. Recycling of material and urban waste management - special areas of focus will be development of technology for producing power form waste. 4. To launch R&D programme, focusing on bio-chemical conversion, waste water use, sewage utilization and recycling options wherever possible. Do you know about National Mission for Sustaining the Himalayan Ecosystem? 1. To reduce energy demand by promoting alternative technologies and energy conservation practices in both residential and commercial areas. 2. Better Urban Planning with a view to enable better disaster management; promoting patterns of urban planning that enable lesser use of private and more usage of public transport. Promoting and encouraging use of lesser polluting vehicles. 3. Encourage community involvement and dialogue for more sustainable pattern of development; participation of stakeholders. 4. Conservation of natural resources such as clean air, water, flora and fauna that are the keystones of sustainable human habitats. This mission concerns in the sense of enhancement of human well-being broadly conceived, are a recurring theme in India’s development philosophy. Sustainable habitat would mean achieving a balance between the economic and social development of human habitats together with the protection of the environment, equity in employment, shelter, basic services, social infrastructure and transportation. Previous Story How does Earth’s Albedo effects the Global Warming?